Like the tiniest of boats, or a twig carried along in a current, a chain of four beads—each bead some 300 times smaller than a single red blood cell—rushes through the branching passages of an artery, bumping along the walls. Suddenly, the chain snags. The lead iron oxide bead sticks to a cancer cell protruding into a blood vessel and is unable to move forward. Now the rushing blood flips the three trailing beads so that the tail faces forward. The tumble puts all four beads in contact with the infinitesimally tiny cell that snagged the leading bead. Because all four beads are coated with a substance designed to glom onto cancer metastases, the entire chain sticks fast to this invader cell. Micro metastases, far too small for even the best imaging technologies to see, are cancer's silent soldiers, capable of turning recovery into deadly relapse. 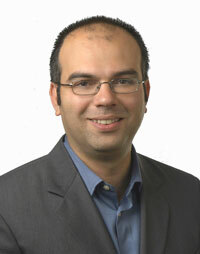 Efstathios (Stathis) Karathanasis, PhD, leads the university research team that created the equally tiny nanochains designed to find cancer cells where they live—and kill them. 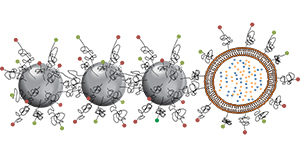 Karathanasis' design brings an important improvement to the first generation of nanoparticles created to attack cancer. "We introduced the oblong shape and made them flexible, which allows them to escape the blood flow and scavenge along the blood vessel wall," said Karathanasis, an assistant professor of biomedical engineering and radiology and member of the Case Comprehensive Cancer Center. Further, Karathanasis and his colleagues covered the outer layers of the nanochains with an agent that binds to integrin, a sticky protein that free-ranging cancer cells wear on their surface. Finally, the team added a cancer-killing payload to the last bead in the chain—a lipid sack filled with a chemotherapy drug. Once the nanochain grabs a cancer cell, researchers employ an electromagnetic field that vibrates at a specific radio frequency to shake things up. In response to the precise oscillations of this electromagnetic field, the three iron-oxide nanobeads vibrate and quickly shatter the chemo-filled lipid sack. The result is a high dose of chemotherapy that is released close to the cancer, minimizing collateral damage to healthy cells. Animal studies have shown the treatment effective, Karathanasis said. Human studies could begin in three to five years. Researchers first need to amass sufficient data and secure U.S. Food and Drug Administration approval. Karathanasis said important collaborations grew out of casual conversations, such as with radiology professor Mark Griswold, PhD, director of MRI research at the Case Center for Imaging Research, who came up with the radio-frequency trigger to release the chemotherapy drug. "It's the Midwestern mentality and the culture at Case Western Reserve that allows people to just talk," Karathanasis said. "And then serendipity occurs." Tobacco virus could help diagnose the deadly disease. Scientists aim to vanquish miniscule invaders. Process could create tiny devices for wearable electronics. Researchers plunge into the tiny worlds.